Is there life after success? 'One of the most common characteristics of a person nearing the end of the first half (of the game of life) is that unquenchable desire to move from success to significance.' Bob Buford believes the second half of your life can be better than the first. Much better. But first, you need time to figure out what you want to do with the rest of your life. 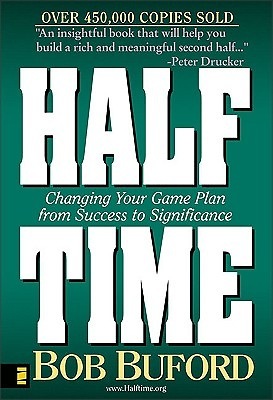 In Halftime, Bob focuses on this important time of transition--the time when, as he says, a person pauses to consider what will make their remaining years rich and meaningful. As Buford explains, 'My passion is to inspire business and professional leaders to embrace God's calling and move from success to significance.' To help people at midlife to embark on their 'personal renaissance, ' Buford lifts up the important questions we need to ask: What am I really good at? What do I want to do? What is most important to me? What do I want to be remembered for? If my life were absolutely perfect, what would it look like? Buford fills Halftime with a blend of personal insight, true-life examples, and hit-the-nail-on-the-head quotes from men who have successfully navigated the exhilarating and potentially dangerous shoals of midlife. The real test of a man is not when he plays the role that he wants for himself, but when he plays the role destiny has for him.--Vaclav Havel The thing to understand is myself, to see what God really wishes me to do . . . to find the idea for which I can live and die.--Soren Kierkegaard Midlife. Halftime. It doesn't need to be a time of crisis; it can be a catalyst. Bob Buford provides the encouragement and insight to propel your life on a new course away from mere success to true significance--and the best years of your life.